This Fanno saw features extra heavy blade construction, a longer blade for faster cutting and a fully enclosed oversized handle for balance and comfort. Razor sharp blade with 5.50 teeth per inch which gives you an extra smooth cutting action that is remarkably clean and fast. 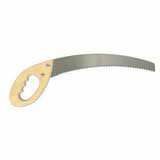 The marine grade laminated hardwood handle is comfortable and durable.